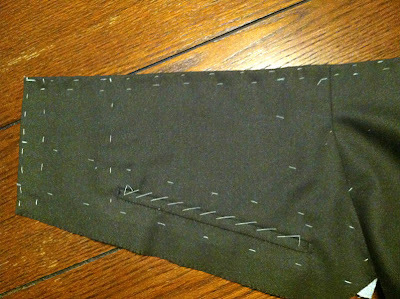 Next up for the trousers are the pockets in the bearers. 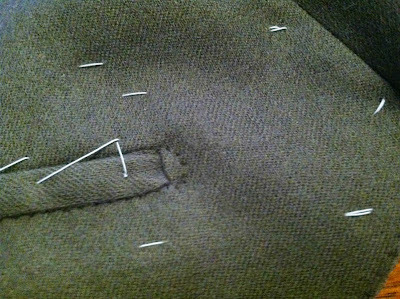 The first thing to do is to sew the bearers to the backs of the trousers along the side seams. 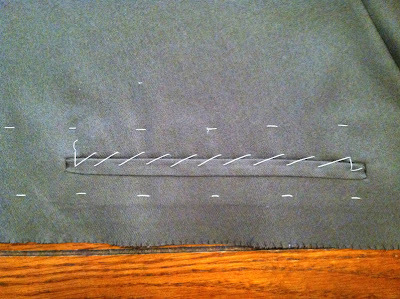 In theory I could also sew the fronts along the side seams, but I figured it would be easier to maneuver without them in the way. A strip of linen is basted behind the pocket marking on the back of the bearer. 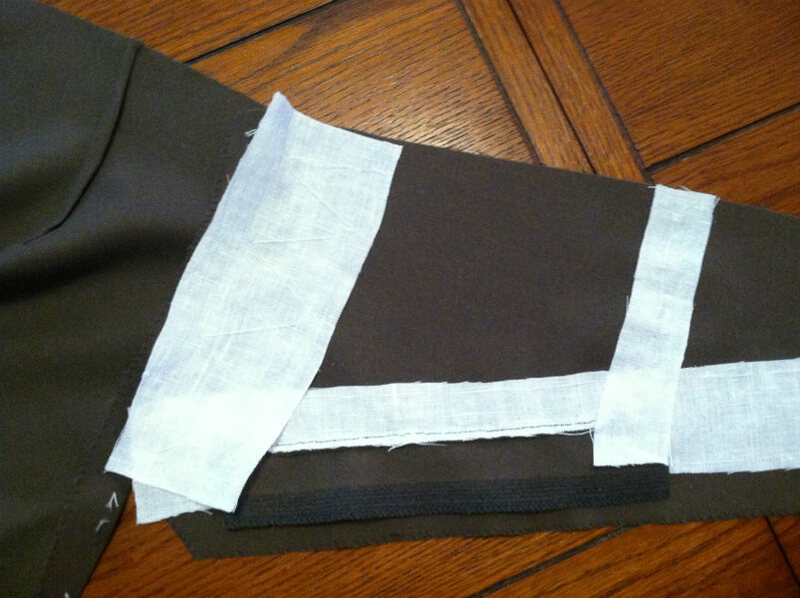 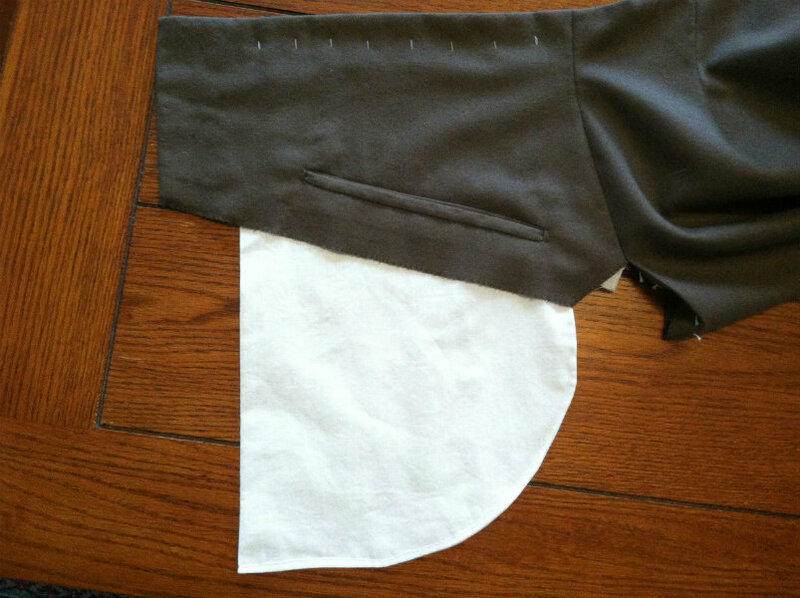 The linen extends over the side seam, so it will also reinforce the fronts when they're attached. 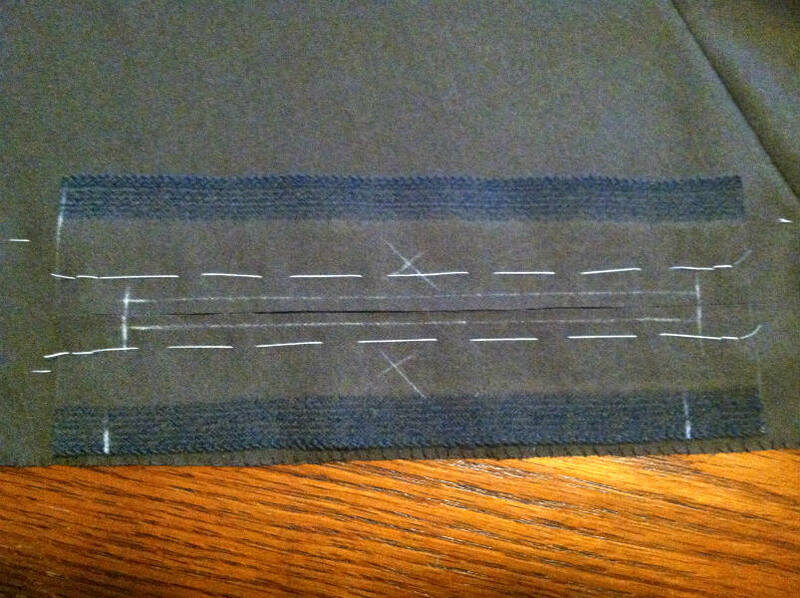 The first pocket jetting is basted along the pocket marking, and lines are drawn in chalk where the pocket ends. Then I realised that I'd basted the jetting in upside down - I want the selvedge to be at the end of the jetting so I don't have to fold it under when I fell it to the pocketing. 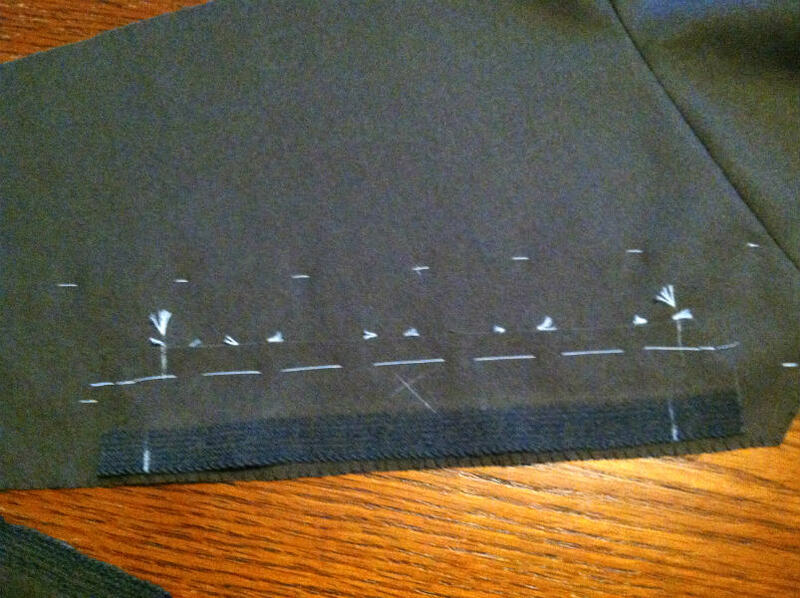 Again, the pocket ends are marked. 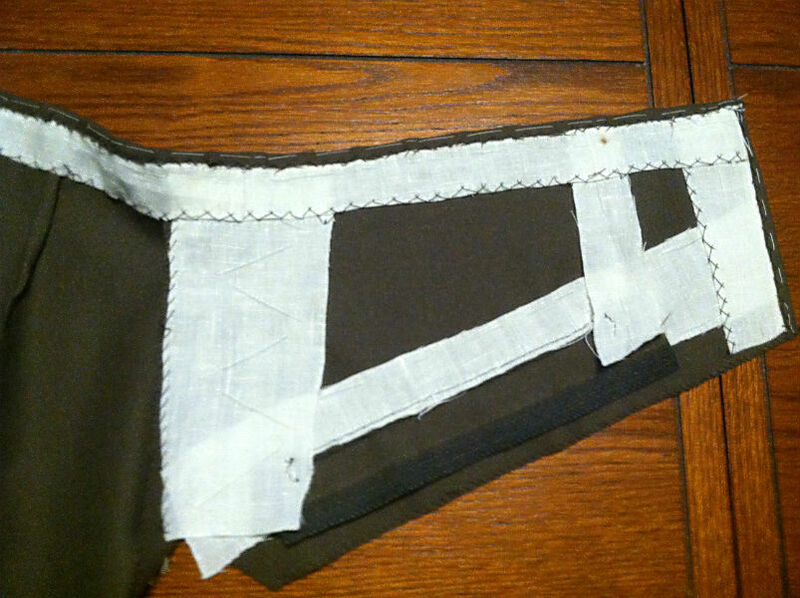 The top jetting is now basted in place as well, and the pocket ends are marked to be even with the bottom ones. 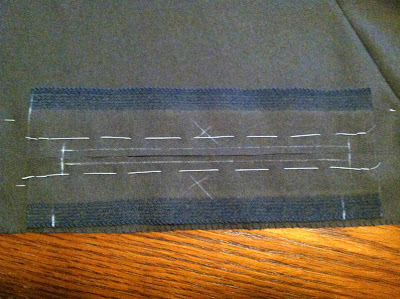 I've drawn in two chalk lines 1/8" from the pocket mouth, just to ensure a straight line when I stitch them. 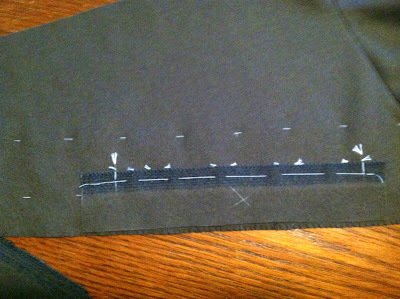 After stitching, I turn the bearer over and cut open the pocket from the back. Note the two "V" cuts at the ends, which are only cut through the bearer and linen - not through the jettings. 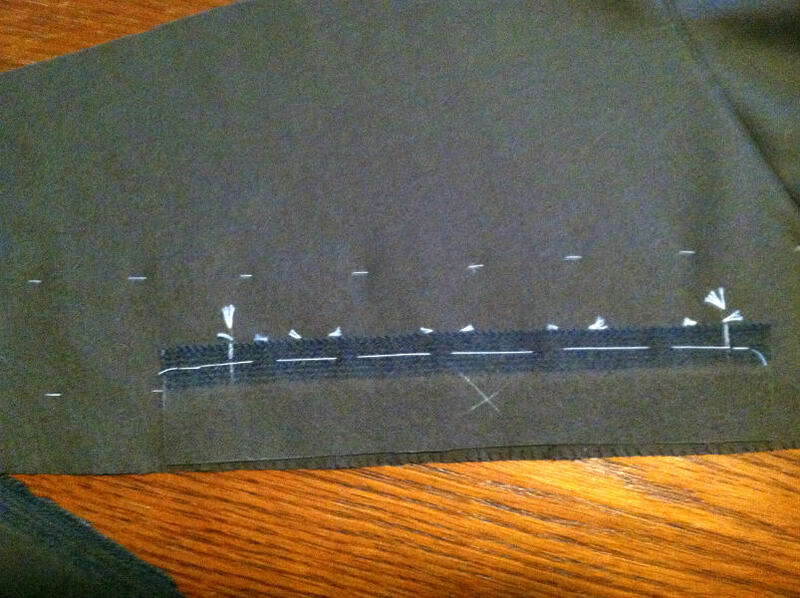 Again in the front, you can see the cut doesn't go through the jettings. I turn in the top jetting so it hangs straight down in back, and the bottom jetting so it folds high enough to cover the entire pocket. The pocket opening is basted shut, and I side stitch along the bottom edge of the lower jetting, just going through the bearer, linen, and lower jetting, not through the top jetting. 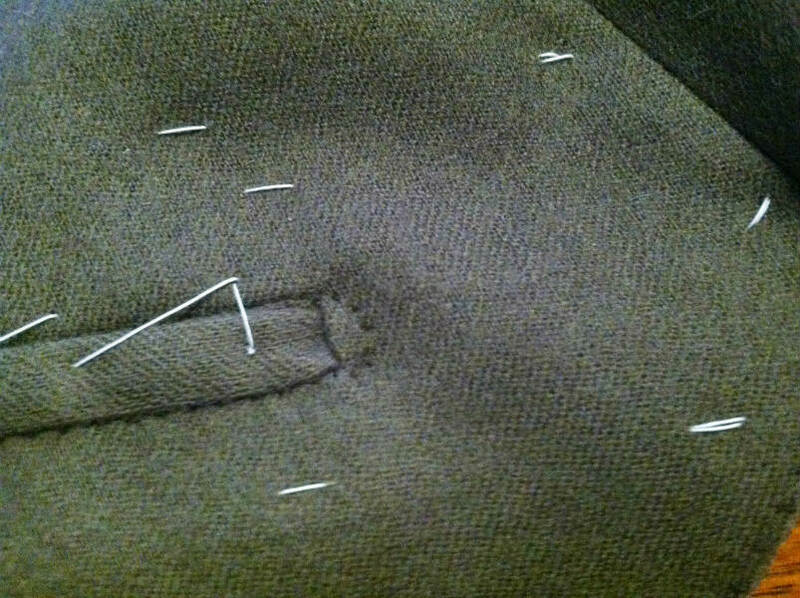 This fixes it in place, but doesn't sew the pocket shut. 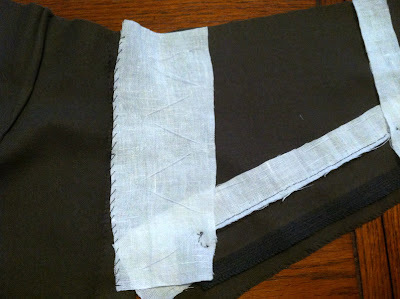 Then in back, I baste two strips of linen for bearers. 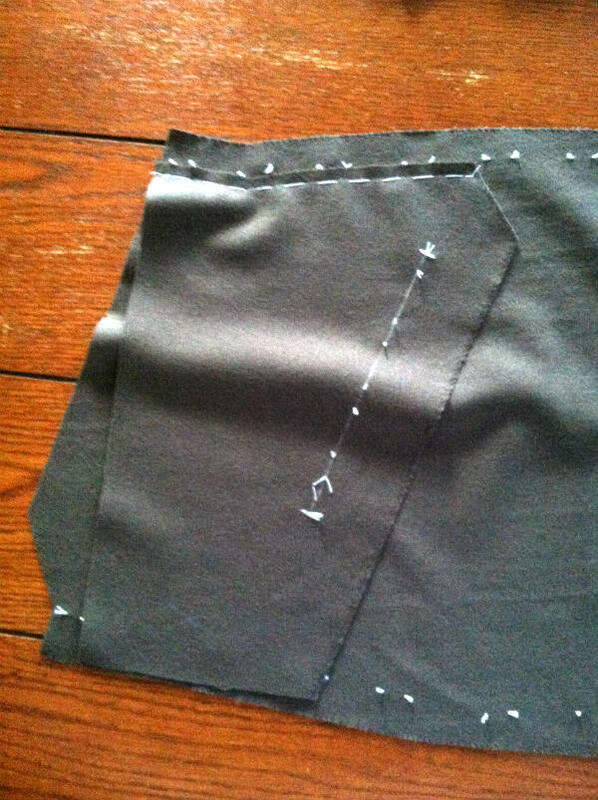 I side stitch two "D" shapes at the ends of the pockets. 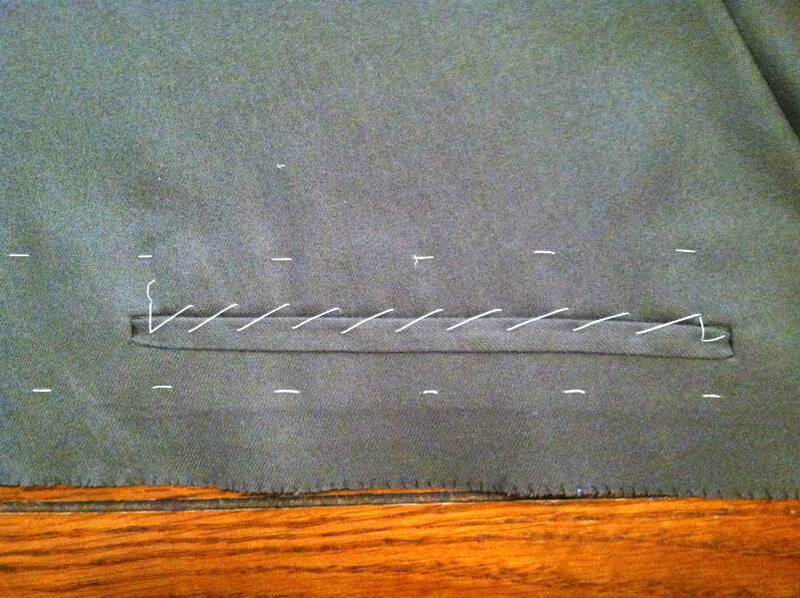 You can see that this stitching goes through the linen bearers. 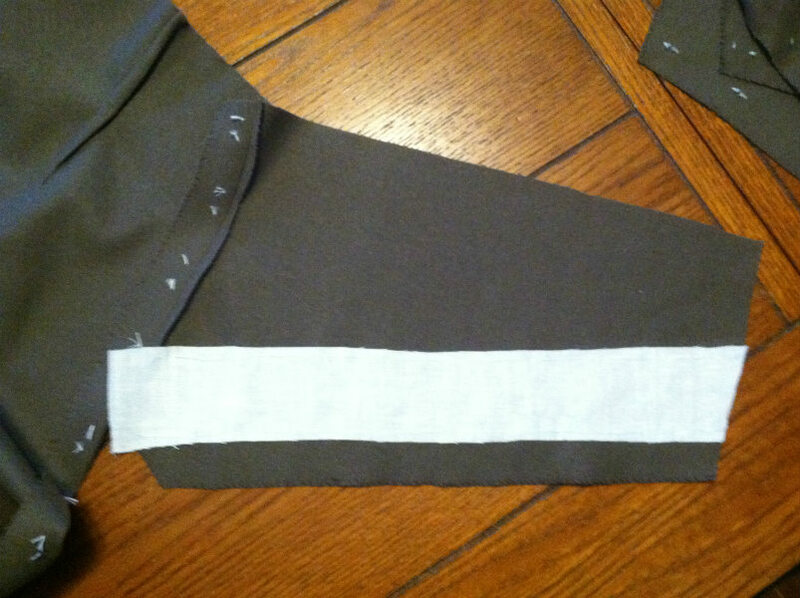 I also fell the side of the larger bearer to the side seam inlay. 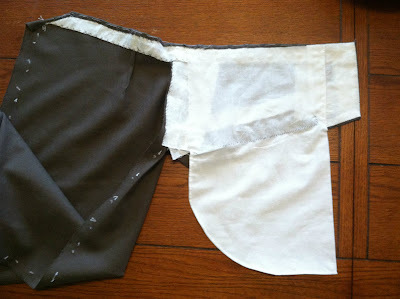 Now here I'm kind of making it up on my own. 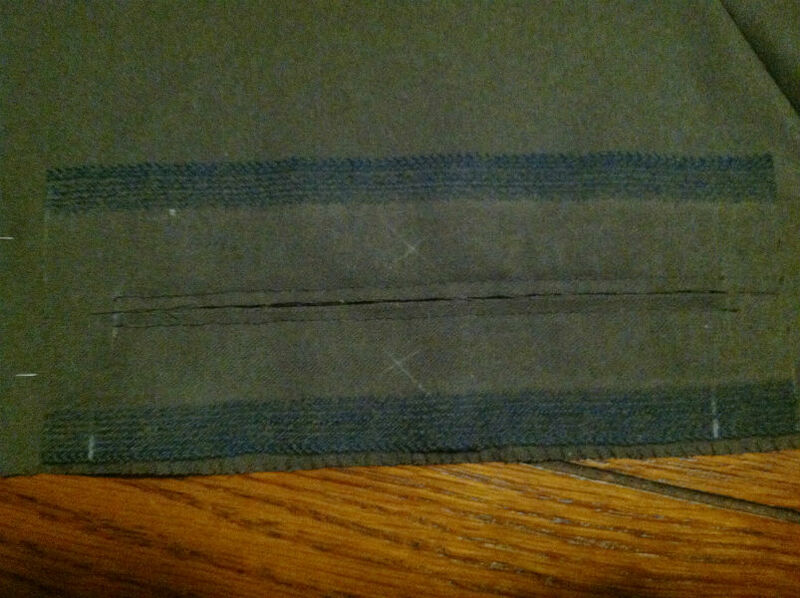 Before putting in any linings, I thought I should have the waistband taken care of, so I basted in some linen, turned over the edge of the waistband, and sewed it all down. Then I felled in the front lining. 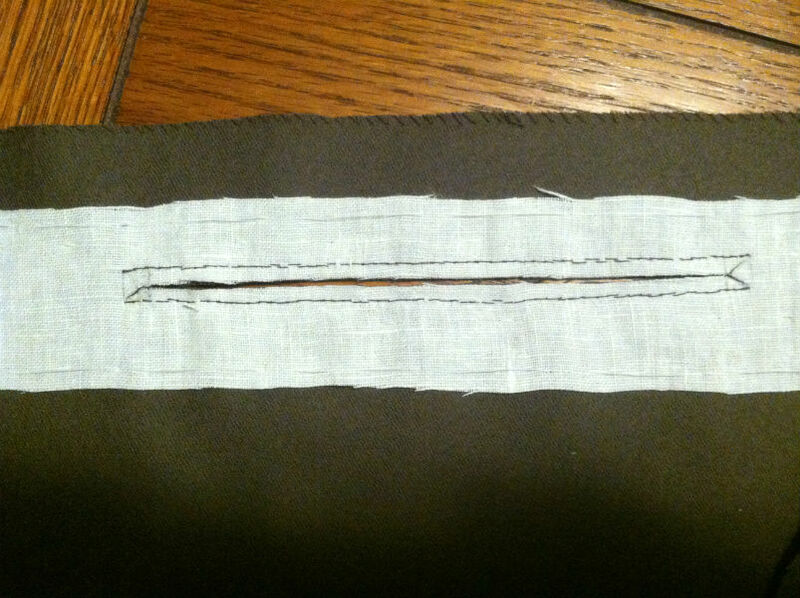 The pocketing is a little thin so you can see through it, but I don't think that matters too much. Finally I added the pocket itself. 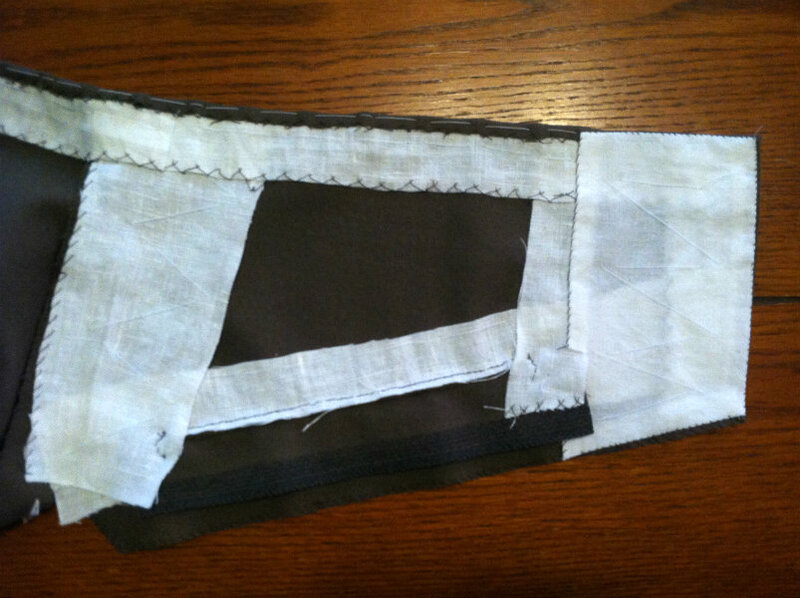 The curve is sewn in a French seam to enclose the edge, and the jettings are felled onto the pocketing. 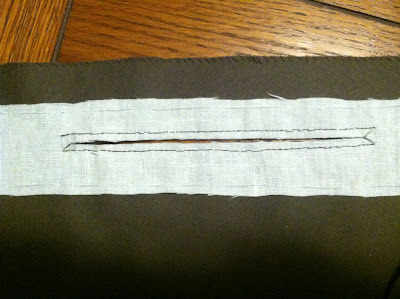 The front of the finished bearer, with only the basting holding the top of the pocketing on left in. I'm not sure how I'm going to finish the rest of the waistband lining, and I think I may add a waistband curtain over the pocketing later. Otherwise I'll just finish the top of the pocket to act as the lining through the side seam.